If you have been following me from my humble beginning of two weeks ago, you can see I'm writing a hodgepodge of my life. When I first woke up this morning, I thought I had "zip" for today's posting. But, as the day lite inched it's way into my bedroom, I turned to face the window. There she was, the windmill. My inspiration for today! During the summer months the trees block a complete view of the top of the windmill. But this morning, the cooler weather has taken most of the foliage from the tree. And, there it was. Standing proudly as she has for many years. 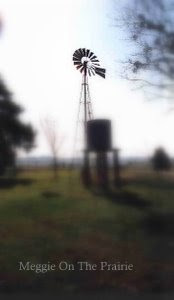 Looking at the windmill in the early morning lite, reminded me of one of the reasons I chose this old farmhouse. Part of me fell in love with the site of her, holding on to be rescued. On the priority list, the windmill has always been on the bottom. But, in order to save her, there have been several occasions where help was needed to keep it from falling down. Stephen, the local carpenter/handyman is doing the job I wouldn't dare attempt myself. Yes, it probably would have been cheaper to take her down and erect a shiny new one. There is no doubt about it....it wouldn't be the same!